The Ottomans provided great contributions towards the fields of psychiatry and neurology. Their thoughts and writings delve into many depths and are worthy of recognition by those in the medical sphere. Figure 1. 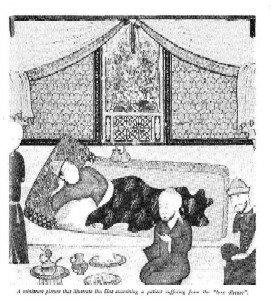 A miniature picture that illustrate Ibn Sînâ examining a patient suffering from the "love sickness". This article was first published in the Turkish review History of Medicine Studies (ed. Hasan Âli Göksoy, Hüsrev Hatemi, Nil Sari), Istanbul 1986, No. 1, pp. 105-112. We are grateful to Nil Sari, author of the article, for allowing its publication. Here we are going to present the classification of mental and neurological diseases found in Turkish medical manuscripts between the fifteenth and eighteenth centuries. Although there are some variations in detail among different manuscripts, I do not intend to go into the description of these details, nor am I going to compare them, for the general overview is the same. Therefore I am going to give the classification of Mukbilzâde (Zahîre-i Muradiye, 1437), whose writing on mental illness is one of the best. Also, I am going to give briefly the descriptions and symptoms of the diseases, so that it will be easier to understand the classic classification of mental diseases found in Ottoman medical manuscripts. Before giving the classic list, I must state that, although mental diseases are studied under the title of the illnesses of the head, a few illnesses such as "ihtinak-i rahm" (hysteria), "hafakan" or "yurek oynamasi" (anxiety), 'sehvetu'l kelbiyye" or "kopekgibi istahli olmak" (obesity), "noksanu'l-sehvet" (lack of appetite) and some other psychosomatic illnesses and sexual diseases due to mental disorders are mentioned amongst the group of related physical diseases. Still other mental illnesses are given under independent titles, one of which is alcohol (sûcîye muptela olanlar), opium (afyonkesler ve berse muptelâ olanlar) and tobacco addicts. Another illness studied separately is "teza'zu-i dimag" which means traumatic head injuries, such as falling from a height, a hard blow to the head and fighting. Gevrekzâde describes the organic changes resulting in the brain following this shock and the consequent motor and sensorial disturbances. Still, another disturbance studied separately is "infiâlât-i nefsâniye" which means emotional and personality disorders. I am sure that if the Turkish medical manuscripts are studied more thoroughly other mental illnesses will be discovered and in this way a complete and correct classification will be accomplished. Here we are going to deal with those mental diseases studied under the illnesses of the head of which "ser-sâm" is usually mentioned first. "Ser-sâm", supposed to be originally Persian, is composed of two words, "ser" meaning "head" and "sâm" meaning "swell". The main symptoms of "sersâm" are confusion of the mind, talking nonsense, fever and trembling. There are different types of "sersâm". One is "feranitis" (sersâm-i safravî), also called "tîz sersâm", which is swelling of the brain membranes. We believe it to be meningitis. Another type of sersâm is "flegmoni" (demevi verem), which is the inflammation of the brain itself. We suppose it to be encephalitis. It has five types of symptoms. These are: the face and eyes of the patient turn quite red, the eyes protrude from their sockets, intense headache, patient is continuously disturbed and has spasm (küzâz), drowsiness and vomiting. Still another type of "sersâm" is "subârî" (sersâm-i sevdâvî), which is the worst type of "sersâm", said in Turkish to be "ifratla olan sersâm-i tîz". Its main symptoms are madness (divânelik) and agitation (asuftelik). The other symptoms are briefly the following: the patient cannot sleep well, sees complicated dreams, wakes up in fear, his eyes are bloodshot, sometimes the whites of the eyes turn yellow, the eye movements are slow and involuntary, tears flow as if there were something in the eye; he speaks non-sense in bewilderment; at the beginning he is very restless, but later slows down so much that he can hardly open his eyes; he has a high fever, his tongue is swollen, his mouth is dry; his pulse is fast and strongly at the beginning, but later on it changes and becomes weak and slow. His breath is also strong in the beginning but later it weakens; he feels such a pain on his neck that it seems as though his veins are being strung. In Mukbilzâde's writings "humre" and "demregu" are said to be diseases of the brain itself. But I am not sure whether it is a type of "sersâm" or not. In the Redhouse dictionary and Tarama Sozlugu "humre" is erysipelas and in Turkish "yilancik, alazlama". "Demregu" (temriye) is a skin disease, lichen or eczema (Tarama Sozlugu). It has three different symptoms. These are, briefly, headache, a strong feeling of heat; coolness of the skin of the face, the colour of the eyes is yellowish; later, from time to time the face heats up and the eyes grow red. The fever and trembling (sitma) it causes are much higher than that of the flegmoni. But most of those who suffer this illness die within three days. If they survive three days they may expect to live on. I wonder if these diseases are mentioned under the title of head diseases, because they might have caused complications when left without effective treatment. Figure 2. A room in a mental hospital. Lunatics and physicians trying to pacify them. The last type of "sersâm" is the cold sersâm (soguk sersâm or sersâm-i balgâmî), "sersâm" without fever, "lijergis" in Greek. The Arabic-Turkish terms for it are "nisyan" and "unutsaguluk" (forgetfulness), respectively, for its main symptom is forgetfulness. It has twelve particular symptoms. These are: a slight headache, a very slight or no fever, a strong feeling of sleepiness, extreme forgetfulness, extreme slowness in movement, pulse slow and light, labored breathing, frequent gaping, a white tongue, profusion of saliva, confusion and inability to distinguish good from bad . Lijergis is said to be lethargy but it may also be dementia. "Seher subati" and "subât-i seherî" are two different illnesses, "Subat" (nevm-i mufrit) seems to have various meanings, such as hypersomnia, absent-mindedness and lethargy. The Turkish term for it is "ogunmak", meaning, to be overcome by sleep, to lose consciousness, feeling sleepy or doze. "Seher" is sleeplessness or insomnia. One who suffers "seher subati" wants to go to sleep, but no sooner than he goes to sleep, he wakes up again. They talk nonsense just as an insane person and some symptoms of frenitis can be observed. Here the humour "safra" (bile) is dominant. Those who suffer "subat-i seheri" sleep much more than "seher subati"; although they can be woken up, they soon go to sleep again. They show symptoms like those of lisergos. If the illness is severe, then there is difficulty in swallowing and urinating and inability to defecate and also asthma. In "subat-i seheri", the humour balgam is dominant. "Ahze" (catalepsy or catatonia) is a sudden paralysis of all the senses and motor activities. One who suffers from "ahze", suddenly becomes rigid in the posture he is in, sitting or standing. If the attack comes while sleeping eyes remain closed, if one is awake eyes remain wide open. The terms such as "suhus", "cumud" and "dutmak" are said to be synonymous. "Mal-i hulyâ" is attached to a great importance and it is not a single illness but a group of illnesses appearing with various symptoms. "Merâkî" and "Kutrub" and sometimes even "Ashk" (Emir Celebi: Enmuzec) are said to be different kinds of "mâl-i hulyâ". Although the main symptoms of "mâl-i hulyâ" are fear, obsession and sadness, they seem to have a great variety. For example, delirium and talking nonsense is an important symptom. In "merâkî" (hypochondriacal attitudes) disorders of the digestive system; in "kutrub", continuous fugitiveness are the main characteristic symptoms. Under the title of "envâ-i dîvânelikler" (different kinds of madness) we find "mania", "dau'l-kelb", "subara" and "kutrub". I suppose they were mentioned under the same title because they have similar symptoms, mainly aggressiveness. Those who suffer from "mania" are in a state of excitation and attack anyone they come across, like beasts of prey. Both their anger and love are always excessive. They usually talk franticly and they have the looks of beasts of prey. They are skinny. "Dau'l-kelb" is a kind of "mania". Sometimes patients are in a bad temper and then sometimes they are cheerful and compassionate. An old dictionary defines "subara" as a disease between "frenitis" and "cilnun" (madness) (Hayrullah Efendi: Lugat-i Tibbiye). We have already described "subara". "Ashk" (love) is an illness. Here the victim causes himself to be ill. When the feeling of love is too deep an illness such as "mal-i hulya" and anxiety will develop. The patient becomes afflicted with this illness when he comes across someone beautiful; he falls in love and becomes fond of his beloved. One who falls in love begins to be thinking of the beloved day and night. This is a widespread story. The main symptoms are: dry and sunken eyes, when he cries he sheds tears profusely, when he hears a poem or a couplet describing separation from the beloved, he feels sad and cries. When his beloved is spoken about his pulse speeds up and becomes irregular. Figure 3. 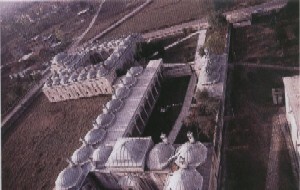 Sultan Bayezid II's mental illnesses patients' hospital and medical madrasa in Edirne, Turkey. "Unutsaguluk" or "unutsaligi" (fasâdu's-zikr) means forgetfulness (amnesia). The senses of the patients suffering from this illness are all sound. Whatever they see, they see correctly, whatever they hear, they hear correctly, but as soon as they hear or see, they forget. If the illness has begun with forgetfulness and dysfunction of the mind has resulted from it, it is easier to cure it. But if the illness begins with the disfunction of thought and discrimination, then treatment is difficult. "Eblehlik" ("humk", "ru'unet", "ahmaklik") or "gaflet" is a hereditary disease. It is a kind of feeblemindedness, and imbecility. Sufferers act like little children or old people. "Ihtilât-i zihn", meaning the confusion of the mind, is an extremely troublesome disease. The functions of thought and discrimination are harmed. Patients will not speak, do, hear or care as they are expected to. In this illness there may be "tahayyul fesadi" (illusion), so that the person suffering from this illness perceives images of men, animals and objects distortedly; or he has hallucinations, perceiving images that, in fact, do not exist. "Uykusuzluk (insomnia) and uyaniklik (vigilance): "Uyaniklik" is a state of perceiving and acting deliberately and as he wills. Insomnia is the opposite of vigilance. Among the different causes of insomnia are various anxieties, sorrows, pain, indigestion, tumours like cancer and old age. Among the symptoms of insomnia are: sleeplessness, dryness of eyes, nose, gums and tongue. Suban: "Kafatasinin (bas, canaginin) icinde toplanan su" (liquid collecting in the skull: Hydrocephalus): It is often observed that liquid is collected in the skull around the hard membrane (gisâ-sulb). Symptoms: Heaviness in the head, difficulty in closing the eyes. It is incurable. Mostly children suffer from this illness. The parts where the water is collected seem to be pulled down. When touched by hand, it moves softly. "Dawwar" (bas cigzinmek, dolab marazi) and "sedere" (gozu kararmak): This is an illness where the world seems to be circling around the patient. As a result, he is unable to stand up and if he tries to stand up feels dizzy and almost fainting falls down again. Objects before his eyes move about. "Kabus" (Agir basmag; nightmare, sleep apnea): While asleep the patient feels as if something or someone such as a heavy man has fallen on him; that heaviness weights upon him. As a result, he breathes with difficulty, tries to shout and move, but he cannot. He nearly goes mad. As soon as the "kabus" has gone, he wakes up. This disease is the beginning of three serious illnesses: "sar'a" (epilepsy), "sekte" (apoplexy) and the insanity called mania. "Sar'a" (Tutanik: epilepsy): Sensorial and motor functions are both irregular and inefficient. While the epileptic attack lasts, the organs of the patient fail to function properly. There are contractions all over the body (tesennuc-i kullî). The cause of the foam in the patient's mouth is spasm (tesennuc). Several types of "sar'a" are mentioned, such as the "sar'a" of the brain (sar'a-i dimag); "sar'a" starting in the stomach (sar'a-i midevî); "sar'a" which is caused by the sting of scorpions, bees etc. ; and "sar'a" seen in women undergoing menopause (ihtinaki'r-rahm: Hysteria). "Sekte" (Can kasilmasi; apoplexy): "Sekte" comes suddenly and as a single attack. "Sekte" begins with vertigo (dewar) and ringing in the ears (tanîn). Sensorial and motor transmission from the brain to the body fails. When sekte comes all the organs and senses cease functioning. The main cause of "sekte" is the excess of blood in the blood vessels; too much blood collects in the cavities of the brain and prevents connection with organs. All the organs grow cold. Some doctors call this illness "ihtinâk-i dîl" or "kalbin nefes alamamasi", meaning failure of the heart to breath, suffocation. It is hard to decide whether the patient with an attack of "sekte" is dead or alive, but the patient may revive in spite of this condition. Therefore the patient supposed to be dead should not be buried until after a certain time. In "subat" there may also be a failure of the sensorial and motor functions, but this condition develops slowly in contrast with "sekte". Figure 4. 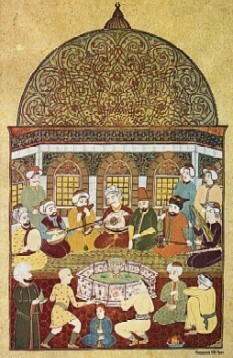 A miniature picture of the insane, illustrating musical therapy at the Bayezid II's Hospital, composed by Nil Sari. "ihtilac": (convulsion) is the involuntary convulsion of the muscles. This convulsion is temporary and passes away rapidly. Besides cold, anger, happiness and anxiety also may cause "ihtilac". It may sometimes be the beginning of "sekte" or "guzaz" (tetanus); or, if it develops in the abdominal muscles it may be the beginning of "mal-i hulya" or "sar'a". If it occurs in the facial muscles, it may be the beginning of "lâkve" (facial paralysis). "Lâkve" (Yuz-goz egilmek: facial paralysis): It is a disease occurring in the eye muscles. The eye, eyebrow, skin of the forehead, lips, chin are distorted from their natural condition and undergo change. Lâkve may be the beginning of "sekte". A patient suffering from this illness is unable to spit properly or chew easily. He dribbles saliva from one side of his mouth. Two different kinds of facial paralysis are dealt with. One is "lâkve tesennucu" (spasmodic facial paralysis) and the other is "lâkve-i istirha" (loosening facial paralysis) and in this type the senses are weakened, the upper eyelid drops down, the gum loosens and fails to hold saliva. "Hadr" (to get numb) is an Arabian term, which means in Turkish (archaic) "tutulmaklik, tutmakhk, a'za uyusmasi "that is, the failure of the senses. This illness occurs in sensorial and motor organs. First the sensorial organs function poorly or fail to function altogether; consequently, motor ability also loses its natural capacity. "Hadr" has seven causes, some of which are opium eating, too much cold affecting the organs, the bite or sting of poisonous animals or insects such as a snake or scorpion and wrenching of the nerves. If the cause of the illness is in the brain, all the motor and sensorial functions cease. If it is in the spinal marrow, weakening of the sensorial and motor functions spreads either all over the body or only in one half, proportionately with the effectiveness of the cause. The senses in the face are sound. Sometimes a vertebra is dislocated, and "hadr" develops. When a nerve of the neck or the vertebra is damaged, the organ which it serves is affected and the symptom can be observed there. Sometimes "hadr" may result in "felg" (paralysis), "sar'a" (epilepsy), "sekte" (apoplexy) or "tesennuc" (spasm). "Ra'se" (tremor, trembling): Ra'se is a disease affecting the organs that are the means of movement. When the sufferer tries to move his hand to do something, involuntary movement intervenes and hinders voluntary movement and from the combination of them ra'se results. It mostly appears in hands or head (bas titremek) and sometimes in all organs. "Ra'se" is incurable in the elderly. "Falic" (paralysis, hemiplegia) is the complete failure and paralysis of muscles and tendons ("mutlak istirha"). Although it is sometimes described as hemiplegia affecting half the 'body, it should be noted that in Turkish manuscripts "falic" has a wider meaning, including paraplegia, in which the head is not affected and sometimes in "falic" all the body is affected, while sometimes a single finger is paralyzed. "Tesennuc" (Sinir cekilmek: spasmodic contraction of a muscle; spasm, cramp, convulsion). There are three types of "tesennuc", in one of which there is congestion of the nerves and muscles (tesennuc-i imtilayî), where the muscles are in spasm. In Arabic it is called "tekallus" (shrink). The cause is generally humidity. In the sanguine type muscles swell and enlarge. When the cause is cold, the patient recovers fast. In "kuru tesennuc" muscles get contracted both in length and width. In "tesennuc" of extreme dryness (yubûset galebesi), the muscles contract. Other causes of "tesennuc" are, sting of scorpions, extreme cold, anxiety and fear, sleeplessness, too much crying, extreme fever, fever and tremor (issi isitma) in children. 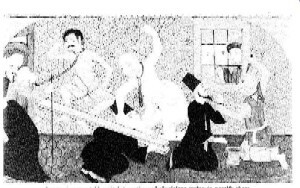 "Kuzaz" (spasm, tetanus, shivering: spastic paralysis): There are several meanings of "kuzâz". One is related to "tesennuc". The other meanings are: the "tesennuc" of the neck ("ense gekilmesi"). In this illness the neck must be put straight so that it will not move forward or backward; "kuzaz" caused by cold and freezing in which muscles shrink. Nerves and muscles become rigid, cannot move, organs are shrunk in every way. But in "tesennuc" the organ shrinks in one way, nerves and muscles expand and contract. Both usually cause ache. "Kuzaz-i dimagî" or "kuzaz" of the brain is the worst. In children's "kuzaz" all the muscles in the back of the head stiffen, they can eat and drink with difficulty, there are convulsions in all extremities, they speak with difficulty etc. In some types of "kuzaz" the muscles of the face are spastic; in others suffering from "kuzaz", the head and neck are turned to one side. There are different kinds of "kuzaz", such as "ku'zaz-i imtilai" and "ku'zaz-i veremi". Figure 5. 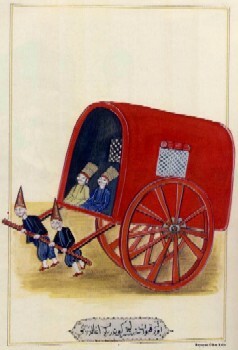 An Ottoman vehicle to carry patients. "Levi", supposed to be Persian or a'ya in Arabic is a state in which the suffered eats and drinks too much for a couple of days, becomes tired and is unwilling to move. He, also feels weak. His veins and muscles contract, he tends to stretch himself. This state is called "levi" meaning to have a bad stomach from overeating. "Suda" (headache) and "sakîka" (migraine) are important headings in medical manuscripts. For instance in "Zahîre-i Murâdiye" 21 and in "Nuzhetu'l-ebdân" 14 types of headaches are mentioned and these main types of headache are classified into other minor groups. Headaches are classified according to their aetiology which depends generally on the four humours and temperaments. "Sakîka" (migraine) or "yarim basagrisi" is described as an illness which comes for a couple of days and then passes away. Pain is felt while the attack (nobet tutmak) lasts. Several factors are mentioned as the cause of headaches. Some of them are: walking too long in the sun, sitting before the fire, taking a long bath, taking hot food, cold, sitting too long without movement, anger, shouting too much, sleeplessness, thinking too much, sleeping too long, fear, crying too much, sorrow, exhaustive reading, and anxiety. — The majority of the mental and neurological illnesses are mentioned under the title of "the diseases of the head". Most of the illnesses due to the disorders of the central and peripheral nervous systems are dealt with in one comprehensive title. — The relations between these diseases are always discussed. — Some of the diseases are more like syndromes, while others are only symptoms. For instance while "mal-i hulya", "ask" are a group of illnesses, "ra'se", "unutsaguluk", "devvar" are symptoms. Some others such as "eblehlik", "kafatasi icinde toplanan su" and "Iâkve" obviously seem to be single illnesses. — Although the names of these illnesses are specific and are classified in a similar way in different medical manuscripts, variations can be noted. — Under the title of one major illness there is usually sub-classifications of which I gave a few examples here. Thus we have seen four sub-types of "sersâm". For instance there are several types of "sar'a", "sekte", "tesennuc" etc. — Although this classification is very different from todays, it is also based on symptoms and organic factors. — Classification depends usually on organic symptoms. I did not come across a tendency to subjective speculation. — The Ottoman physicians knew that such illnesses were disorders of the central and peripheral nervous systems. — The sub-types of some diseases are classified according to their etiology which depends generally on the four humours and temperaments. — We find some of the Turkish terminology quite interesting and absolutely to the point. For example, "unutsaguluk", "bas cigzinmek", "agirbasma", "dutarik", "can kasilmasi", "yuz-goz egilmek" etc. We expect others to be discovered in the course of study and research. — I conclude from my studies that Ottoman doctors had an advantage in having the heritage of the earlier Islamic medicine, to which they made their own contributions and so could build up a good knowledge of psychiatry and neurology. Emir Celebi: Enmuzecu't-tib. Cerrahpasa Tip Fak. Tip Tarihi Ktp. No. 96. Emir Celebi: Neticetu't-tib. Cerrahpasa Tip Fak. Tip Tarihi Ktp. No. 59. Esref bin Muhammed: Hazâ'inu's-Saâ'dat. By. Bedi N. Sehsuvaroglu. TTK,. XI. No: 9, Ank. 1961. Hayrullah Ef. : Kamus-i- tib, Cerrahpasa Tip Fak. Tip Tarihi Ktp. No. 581. Ibn-i Serif: Yadigar. Cerrahpasa Tip Fak. Tip Tarihi Ktp. No. 311. Koptagel -Ilal, G. ve Kazancigil: A.: Ortadogu ve Islam Dunyasinda Bilimsel Dusunce ve Psikosomatik Hekimlik Kavraminin Tarihsel Temeli. I. Uluslararasi Turk-Islam Bilim ve Teknoloji Tarihi Kongresi. Bildiriler II., s. 71-86, Istanbul 1981. Mukbilzâde Mu'min: Zahîre-i Muradiye. Suleymaniye Ktp. H. Mahmud No. 5507. Nidâî: Menâfiu'n-nâs: Cerrahpasa Tip Fak. Tip Tarihi Ktp. No. 133. Sâlih b. Nasrullah: Gâyetu'l-beyan fi tedbir beden-il insan. Cerrahpasa Tip Fak. Tip Tarihi Ktp. No. 117. Sâlih b. Nasrullah: Nuzhetu'l-ebdân fî tercumet gayetu'l-itkan. Cerrahpasa Tip Fak. Tip Tarihi Ktp. No. 551. Sari (Akdeniz), Nil: Gevrekzâde Hafiz Hasan Efendi ve Kafa Travmalan Hakkindaki Bilgisi. I. Uluslararasi Turk-Islam Bilim ve Teknoloji Kongresi, 14-18 Eylul 1981. Sari (Akdeniz), Nil: "Osmanli Tibbinda Beden ve Nefis Terbiyesi" "IV. Milli Turkoloji Kongresi Bildirisi, 19-23 Ekim 1981 Ist. Sari (Akdeniz), Nil: "Nidaîye Gore 'Keyif ve 'Afyonkes' Tedavisi". Yeni Symposium, Yil: 19, Sayi: 1, Ocak 1981, Ist. S. 19-25. Sari (Akdeniz), Nil: "Halk Hekimliginde ve Osmanlica Tip Yazmalarinda Akil ve Sinir Hastaliklarinin Tedavisi" II. Milletlerarasi Turk Folklor Kongresi Bildirileri, C. IV, 1982, Ank. Sari (Akdeniz), Nil: Osmanlica Tip Yazmalarinda Mâl-i hulya ve Tedavisi (XV.-XVIII. yy.) Ist. Uni. Cerrahpasa Tip Fak. Deontoloji Anabilim Dah, 1982, Ist. Suleyman b. Abdulmennân: Cem-ul mucerrebât (1176) Cerrahpasa Tip Fak. Tip Tarihi Ktp. No. 166. Sehsuvaroglu, Bedi N.: Sair ve Hekim Ahmedî, Ist. Tip Fak. Mec. C. 16, Sayi: 4, 1953.